The 3UR-FE engine is a member of the new Toyota’s UR family. It is a 5.7-liter V8 with aluminum block and heads. This engine is the biggest displacement version of UR family designed for use in heavy Toyota’s cars and trucks (Tundra, Sequoia, Land Cruiser, and Lexus LX570 models). The 3UR-FE engine became a suitable replacement for the 4.7-liter 2UZ-FE. Like other members of its family, which also included the 1UR-FE/FSE, 2UR-GSE/FSE, the 3UR-FE has an aluminum cylinder block with 90-degree 'V' angle. Bore pitch is 105.5 mm; 21.0 mm cylinder banks offset. All UR engines have a 94 mm bore size. There is a 102.0 mm stroke for increasing displacement to 5.7l. The 3UR has its own forged steel crankshaft with six balance weights, forged connecting rods, and aluminum alloy pistons with a resin coating. Four oil jets in the block cools pistons by oil. The 3UR-FE heads have the same design. They are aluminum alloy cylinder heads with camshaft housings, four valves per cylinder (two exhaust valves and two intake valves), and double overhead camshafts. The valves are actuated by roller rocker arms. The 3UR-FE engine has hydraulic lifters. The engine uses two primary timing chains for the intake camshafts. Each intake camshaft drives the exhaust camshaft by the secondary timing chain. All chains have a chain tensioner that used oil pressure and a spring. The engine can control the intake and exhaust camshaft angles by the Dual Variable Valve Timing – intelligent system (Dual VVT-i). The intake manifold of the 3UR-FE is made from plastic and equipped with Toyota’s Acoustic Control Induction System (ACIS). This system allows changing a length of the intake ports according to the engine speeds. The 3UR-FE has linkless-type throttle body with electronically controlled throttle angle by ETCS-I (Electronic Throttle Control System – intelligent). The 3UR-FE uses a sequential fuel injection (SFI) only, there is no direct injection. The air mass and flow rate are measured by slot-in type air flow meter which also has a built-in intake air temperature sensor. There is also Toyota’s DIS ignition system (Direct Ignition System) which used individual ignition coils for each cylinder. The 3UR has iridium-tipped spark plugs with extended service interval. The 5.7-liter engine has 4-2-1 stainless steel exhaust manifolds (headers). The 4-2-1 or semi-dual structure reduces exhaust gas interference and provides more torque at middle speed. To meet high emission standards, the engine has two ceramic three-way catalytic converters on both sides and Exhaust Gas Recirculation (EGR) system. 0.4 (0.42 qt) – oil filter. 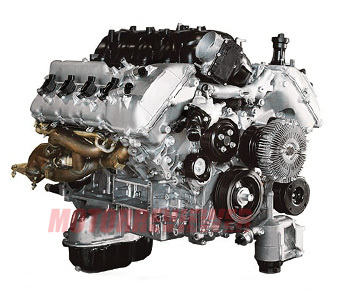 The 3UR-FE is the most reliable and durable engine for all UR engine family. The Toyota made over 1.3 million kilometers of durability testing for this engine. In reality, the 3UR-Fe can run more than 400,000 miles (650,000 km) smoothly with regular maintenance with using high-quality fuel and oil. But nothing is perfect and this engine too. The 3UR-FE has a problem with coking of the piston oil rings which caused high oil consumption. After that, the oil consumption increases over time. To avoid this problem, use only the recommended high-quality oil and watch the oil level. The 3UR-FE crankcase ventilation system sensor fails hugely often, and electronic throttle system ETCS-i is not as reliable as it should be. The problem with water pump is also found in this engine. Like other UR engines, the 3UR-FE has a leaking water pump with short life about 60,000 miles (100,000 km). The 3UR-FSE TRD Supercharger. Toyota's TRD offers the supercharger kit which covered under warranty and could be installed by dealers. The kit includes a bolt-on Twin Vortices Series Roots-type supercharger which boost the performance of the 5.7-liter engine up to 504 hp (376 kW) of power and 550 lb ft (750 Nm) of torque. 3UR-FBE - An E85 Ethanol version that was available as option for 2009-2014 Toyota Tundra and 2009-2014 Toyota Sequoia.